Server systems are, by definition, more important than individual endpoints. They must provide services to hundred, or even thousands, of endpoints and, naturally, must be secure. Traditional anti-virus (AV) solutions can provide protection for servers. However, constantly running AV processes, along with potentially frequent signature updates, can consume resources that could otherwise be used to provide application services to users. 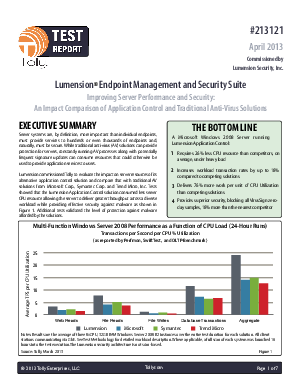 Read this evaluation by Tolly, commissioned by Lumension, as the dive into the impact on server resources of the alternative application control solution compared with traditional AV solutions from Microsoft Corp, Symantec Corp, and Trend Micro, Inc.